Welcome to North Coast Creations May Release! This month, North Coast Creations is releasing two stamp sets that are great for creating masculine cards! Continue reading below to find out how you can win one of two North Coast Creations $10 Gift Certificates good towards the purchase of NCC Stamps. 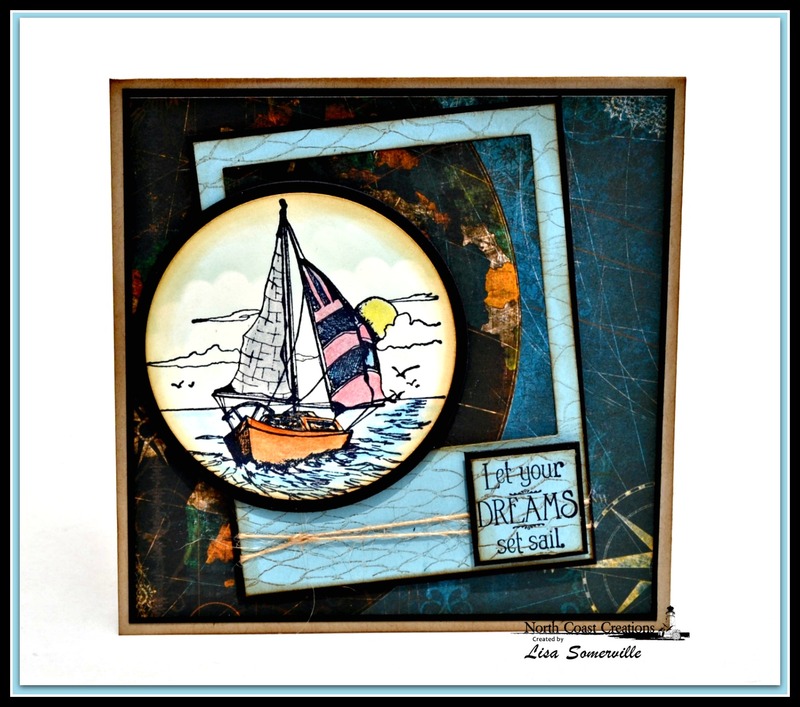 My first card uses the Sail Away stamp set along with dies and additional stamps from Our Daily Bread Designs. The sailboat from Sail Away is stamped in Black ink on White card stock and colored using STAEDTLER Watercolor Pencils, blending with Gamsol. I sponged Blue clouds in the background and die cut the panel using the ODBD Circle Ornaments die, layering on a Black panel that was die cut using the ODBD Matting Circles dies.To created the Polaroid Frame panel, I used one of the dies from the ODBD Lacey Layered Squares to die cut the opening, stamping the panel in Caramel using the Fishing Net Background. I stamped the sentiment on a scrap of the stamped card stock and embellished the panel with twine. 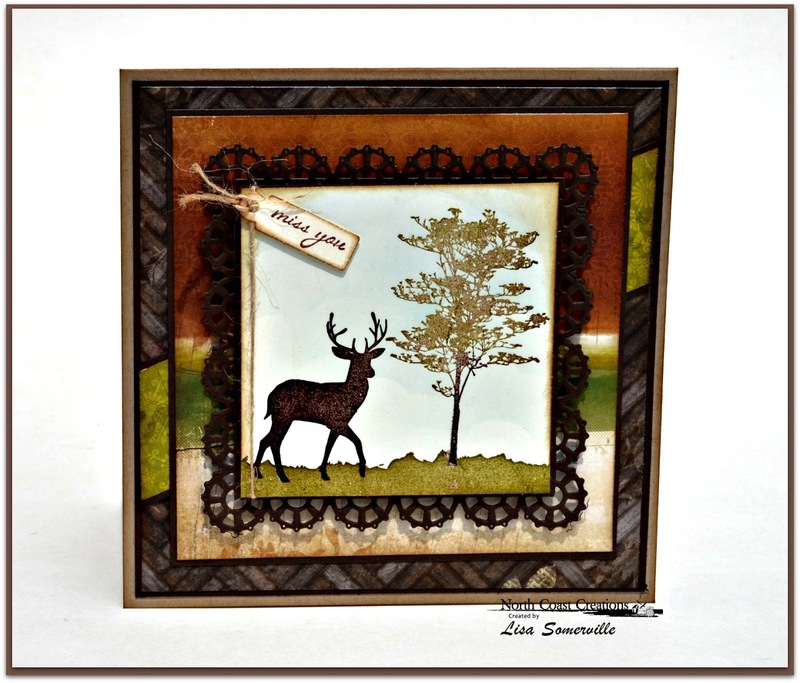 My next card uses images from the Deer Silhouette Greetings stamp set along with dies from Our Daily Bread Designs. To create the stamped scene, I stamped all images in colored ink on Vanilla card stock and clear embossed. 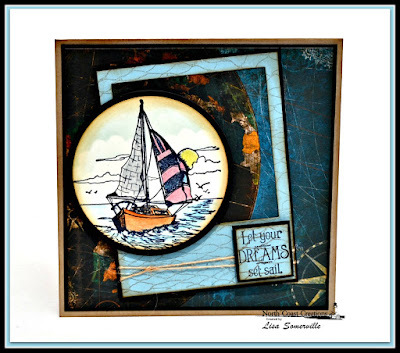 I added the clouds by sponging Blue ink over cloud die cut panel. 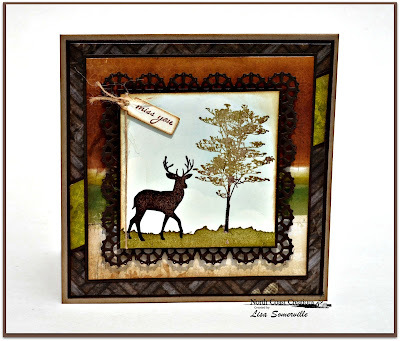 The stamped scene is mounted on an Espresso panel that was die cut using the Layered Lacey Squares Die. I inked a portion of the sentiment, stamping it on Vanilla card stock and die cut the panel using a tag from the ODBD Mini Tags die set. Two randomly selected winners will each receive a $10 gift certificate to North Coast Creations, good towards the purchase of NCC stamps, just for commenting on the Design Team cards! You have until May 31, 2015 at 10:00 PM EDT to leave a comments on the participating designers blogs for a chance to win! Winners will be posted June 1, on the North Coast Creations Blog, so be sure to check back there to see if you are one of the winners! Two fabulous masculine cards (something I always struggle with). Love them both!!! Cool layout on the 1st...love the dsp peeking through the die cut panel...perfect dsp too!! The 2nd melts my heart....awesome colors and fabulous design!! HUGS!!! I agree, Great Masculine cards. I am Always in need of, and I am always short of ideas on. My Favorite time of year is Autumn, so your second card sends me to that "Feel Good" place, when I look at it. Bravo !!!! Oh Lisa, I love your nautical card! Love the sort of globe/map image bg, your frame with twine and circle with the wonderful sailboat! Such a great look! Your deer card is framed so beautifully with fantastic colors for a manly card! Love the little sentiment tag on top as well! Beautifully created! I love your sample cards! Your coloring on the sailboat is great! Both these stamp sets would be perfect for some masculine cards. Thanks for the chance to win! Beautiful cards. I especially like the sailboat card, beautiul! Beautiful cards. I have a hard time finding great masculine cards. These are wonderful! These are beautiful! Love the offset on the first card! Awesome cards, Lis!! MY favorite is the deer card since it has some great texture to it!! Wonderful!! Beautiful samples, Lisa! Love the embossed deer scene!! Love both cards Lisa!!!! Lovin' the brown/rust tones on the second! Such vibrant and wonderfulmasculine cards Lisa!!! I especially like the way you designed the deer card with the torn paper and square die!!! WOW!! !